Until recently, Apple Watch owners who use Spotify had little option to control streaming music from their smartwatch beyond using the native audio controls that appear on its screen in response to iPhone audio playback. Unhelpfully, Spotify remained silent on its lack of an official app for Apple Watch for years, leaving many wondering if one would ever appear. It wasn't until early 2017 when users began voicing their support for Spotty, an unofficial Spotify app developed by Andrew Chang, that the streaming music service took action. Unfortunately for fans of Spotty, that action was taken by the company's legal team, which cited copyright issues with the app's name and took umbrage at interface similarities with its official iOS app. But just when Spotty (renamed Snowy) appeared to be facing the chop, Spotify changed its tune and hired Chang to work together and turn it into Spotify's official Apple Watch app. 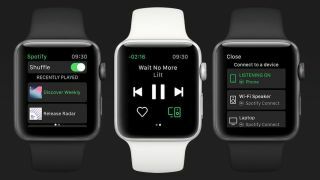 Fast forward to November 2018, when the first version of Spotify for Apple Watch was finally born, giving subscribers the ability to seamlessly access and control their favorite music and podcasts from their wrist without missing a beat. Keep reading to learn how to set up the app on your Apple Watch, how to use it, and what missing features we can expect in future updates. The following steps will work for both free and premium Spotify users. Beyond that, the only requirement is that you have the latest version of Spotify installed on your iPhone – be sure to check the App Store for any updates to the app, then meet us back here when you're all updated. In the My Watch tab, under the heading "Installed on Apple Watch", check that Spotify appears in the list. If it isn't, scroll down to the section titled "Available Apps" and tap the Install button next to Spotify. Once it's installed, select the Spotify app from the Apple Watch's honeycomb app picker screen, or open the Spotify app on your iPhone and it will automatically launch on your wrist. The Spotify app's playback functions are what you'll first notice when it launches on your Apple Watch screen. The three middle buttons let you play/pause and skip forward/back whichever track is currently playing – the track's title scrolls above them. To the right of the track title is a volume level, which you can control directly by turning your Apple Watch's Digital Crown. Below the playback functions is a heart button for adding the currently playing track to your library, which you can then access from the Spotify app on your iPhone. To the right of the heart icon is a Spotify Connect button that, when tapped, takes you to a list of available audio devices that you can connect to, including your iPhone and any Bluetooth speakers you've previously connected to that are in range. A quick swipe right on the main screen will reveal a list of recently played music on your Spotify account. You can scroll through this list with the Digital Crown or your finger, and tap a playlist or album to start it playing. Unfortunately you can't select to play individual songs from your Apple Watch, so you'll have to skip through tracks to get to the one you want to listen to. Alternatively, you can turn on shuffle by toggling the switch at the top of the recently played screen. As it stands, the official Spotify app for Apple Watch offers no facility to store music locally on your wrist for offline listening. That's bad news for earbud-wearing runners, for example, or users who go for a workout and tend to leave their iPhone at home. It would be a major omission for Spotify to overlook this feature, so with a bit of luck we'll see it added in a forthcoming update. Watch this space. There's more bad news for Apple Watch LTE owners with a data contract who were hoping to stream their music directly to their wrist for listening on a pair of connected Bluetooth headphones. Currently the ability doesn't exist and sadly there's a good chance it never will. That's because Apple's new API for watchOS 5 doesn't allow third-party apps to use cellular or Wi-Fi streaming.